This is such a delicious and easy dessert. It could also be served with spiced stewed plums in the autumn and a selection of summer berries in summer time. Put the rice and 300ml of water into a saucepan and bring to the boil. Cover and simmer gently for about 15 minutes or until all the water is absorbed. Mix together the coconut milk with the palm sugar and stir until dissolved. Add to the warm rice, cover and set aside for 30 minutes. Peel the mangoes and cut off the two outer cheeks of each fruit, as close to the stones as possible. Discard the stones and slice each mango cheek into thin slices. For the palm syrup, place the palm sugar, mint and 50ml water into a small pan and boil for 3-4 minutes, until the liquid starts to thicken. Allow to cool slightly and remove the mint leaves. Spoon the rice into a darole mould or a coffee cup. Press lightly and turn out onto a plate to create a mound of rice. 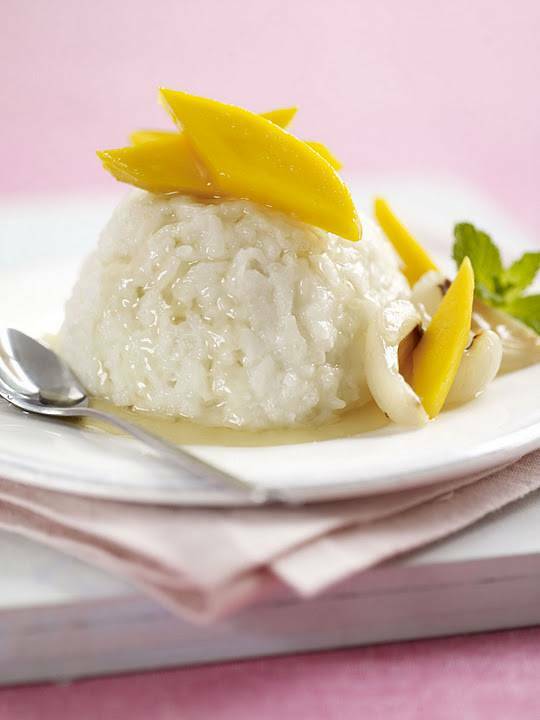 Top with the mango slices and lychees, drizzle with the palm syrup and decorate with mint leaves. Guest Post Credits- Thai Taste.